You can find the yellow check in poles on both metro and train platforms and at metro stops where there are no gates (metro 51, Amstelveen route). 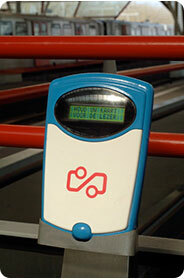 You can find the blue e-purse balance readers at all metro stations and metro stops. 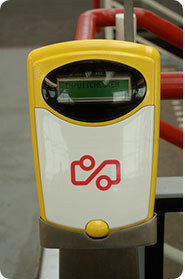 Hold your card in front of the red OV-chipkaart logo on the pole, as show in the photo. If you are not checked in yet, the pole will check you in. The card reader display shows the remaining balance for each travel product on a personal or anonymous card. Hold the card in front of the reader and you will see how much balance is remaining on the card.